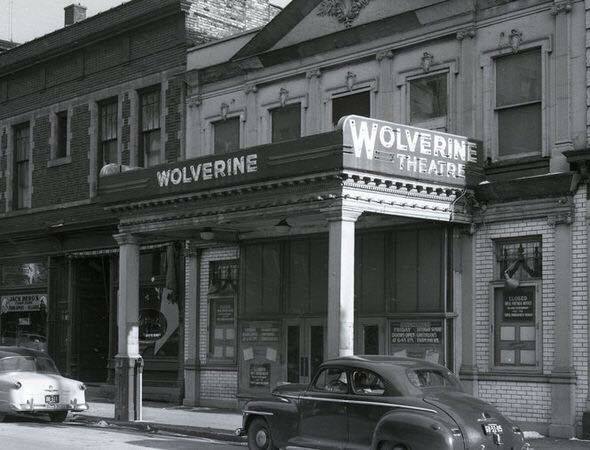 I came across this old photo of the Wolverine Theater on Hamilton Street. The building is still there although it’s no longer a Theater and the marquee and awning are gone. 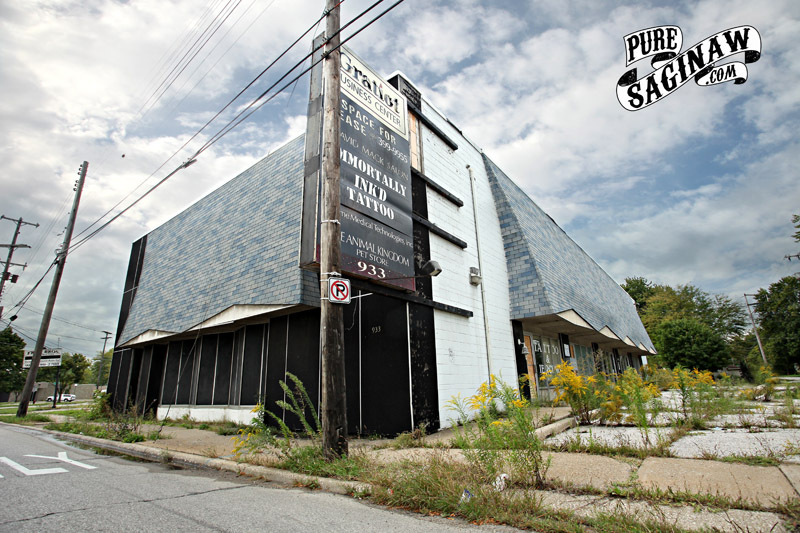 It opened in 1911 on 118 South Hamilton with Vaudeville shows performing on its stage. A few years later it was converted to show movies in 1913. I was not able to find any information on when the theater closed but over the years the building has been used for different businesses including an Arcade and the Old Town Gym. It was also the first location for Intermission Deli which is where it got the name from since it was in an old theater. Last I read that there was going to be a music store opening up in the old building, but I am not sure when or if that is going to happen. I posted a photo from the 1905 flood a while back HERE. Looking closely at it, I noticed in the background was a sign for “Dreamland”. 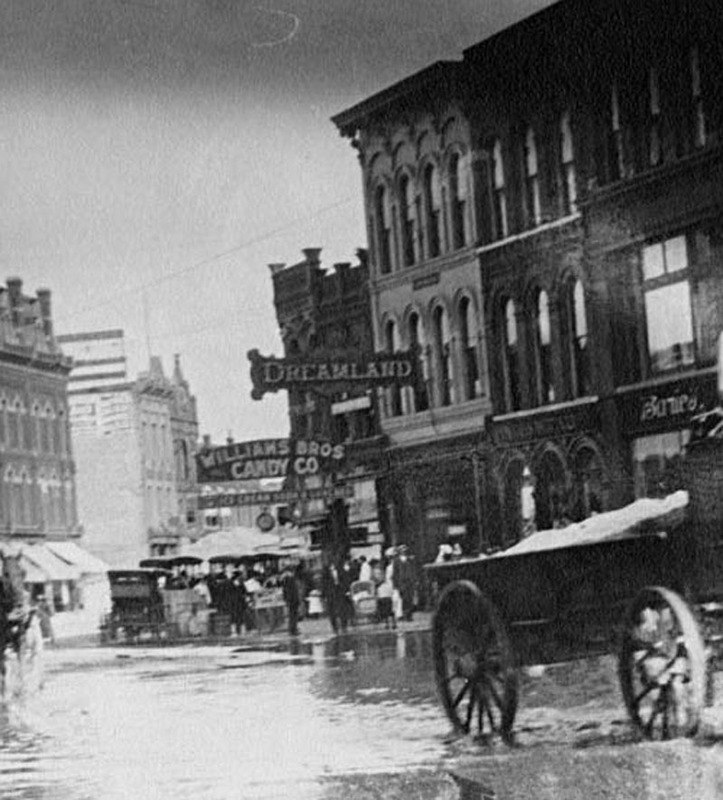 I have been working on posting histories of the old theaters in Saginaw and It was fascinating to me that I found the old Dreamland theater in this photo. The theater once stood at 408 E. Genesee where it makes the turn to the south and where Rally’s is located now. I cold not find the exact date when it opened, but this photo was from 1905. That’s when some of the early theaters and nickelodeons began to open up in old storefronts across the united states. the 1915 Polk directory lists George Marr as the manager and Russel Marr the film operator, I am guessing Russel is his brother. The 1921 Polk directory lists Harry Mabrey as the manager. Sometime after 1915 George Marr must have left to start his own theater. He and his wife were the owners of the Marr Theater on Gratiot HERE and the Royal Theater on Jefferson HERE. The info I found said the theater closed in 1925 but then reopened at a later date, but it did not say which year. then it said it closed in 1940. if anyone remembers the old Dreamland theater I would love to hear about it in the comments. I hope you will sign up for email updates You may miss my posts in your Facebook Newsfeed. I figure since today is the day they give out awards to the movies that I have not watched, and probably never will since they ain’t my kinda movies, I thought I would post a pic of the old Quad. While the new theater is nice, I saw a lot of great movies in the old one. I saw Star Wars, Rocky, The Shawshank Redemption, Goonies, Indiana Jones, The Karate Kid and Saving Private Ryan just to name a few. I find it ironic that there is a new theater, but it seems like a lot of the movies they show are remakes and sequels of movies I saw as a kid. The Royal Theater at 2300 South Jefferson was built by George Marr sometime in the late 30’s or early 40’s. After the theater closed, it was converted into apartments in the 70’s. Now it’s just another empty lot on the east side since it recently had a date with the wrecking ball. Because I was a kid that grew up in the suburbs, I am used to driving to the store or the movies or wherever I needed to go, It would be strange to me to have a movie theater in a neighborhood that was within walking distance to your house. I guess times were different back then. P.S. 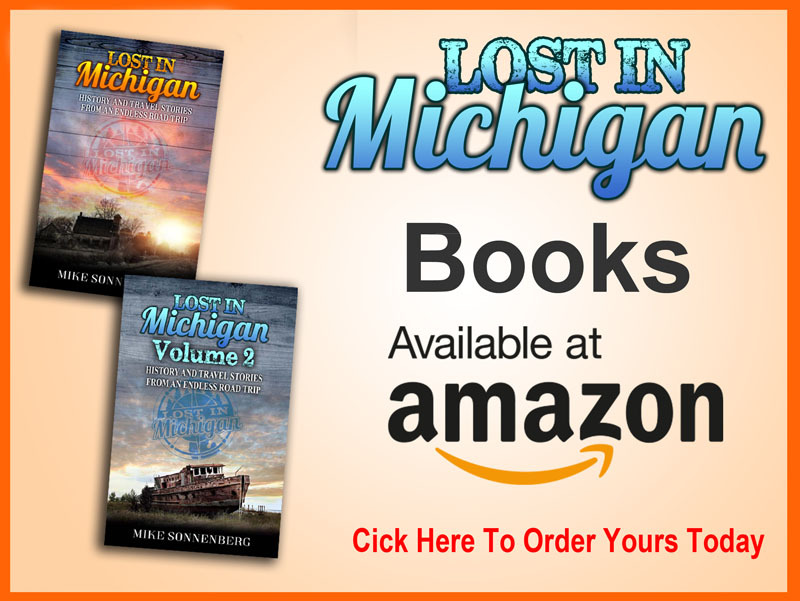 sorry I have not been posting much lately, I have been busy working on my book for my Lost In Michigan website, I hope to be finished with it soon then I can get back to writing more post for Pure Saginaw. 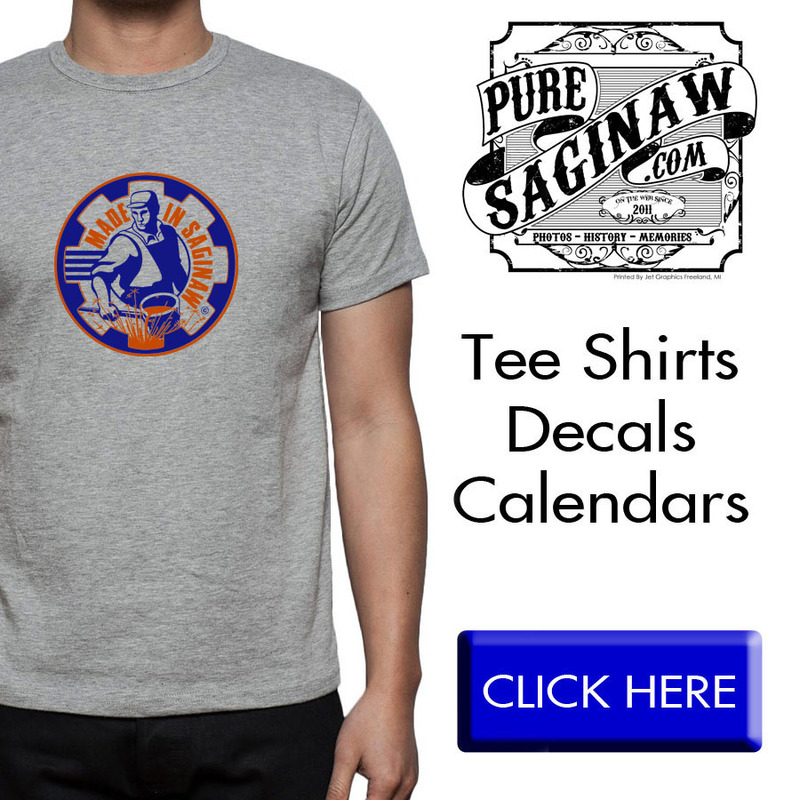 Pure Saginaw T-shirts are on sale this week including the new green BEANS shirts and gray hoodies. you can check them out HERE Thank you to everyone who got a shirt from me, you have no idea how much your support means to me. I went by the Court Street Theater and I could not resist taking a pic of the refurbished marquee with its beautiful neon lettering illuminating the new facade. If the inside is anything like the outside I can’t wait to see what it will look like. I am not sure what the plans are for the grand old theater, but it sure is exciting to see what the new owners have done with it. I love the new marque on the Temple Theater, and I finally was able to get a nice pic of it the other night, even though my hands were frozen holding on to my tripod. I was told the new marque is styled after the original one from the 1920’s, altho I don’t think it originally had the led screen on it way back then. It will be easier for the theater to display messages, but I am gonna miss the “old school” lettering that required someone with a ladder to climb up and change the sign. 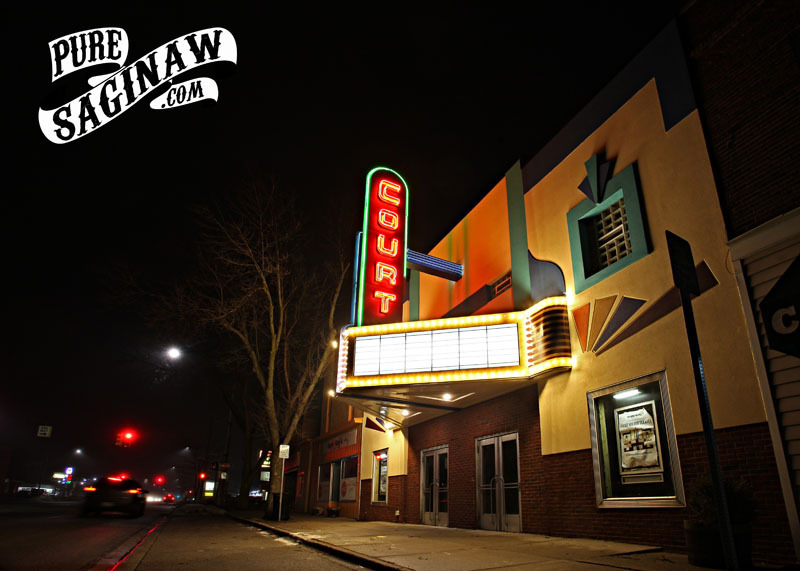 Time for another post in my old theaters of Saginaw series, I figure this time I can post something a little more recent that I remember, the old Cinema and Suds on the corner of Schust and Fashion Square Blvd. I could not find out exactly when it opened and closed, but it was around in the early 90’s, I remember watching Backdraft (1991) and Cool Runnings (1993) at the old theater/restaurant. It was not open very long, but I like going there although my wife and I were young at the time, and it was somewhere to go and watch second run movies for cheap and then we usually got some thing inexpensive to eat. I guess that’s whey they went out of business and its a medical office now. I think it would have been done better if it was more of a restaurant with good food that happened to show movies, instead of a movie place that sold mediocre food. If I had the money I would make something like the Sci Fi Dine In and showed classic movies, but I guess I am only dreaming again. Now that I am getting older I know how my Grandparents felt remembering places that are gone. If only my flux capacitor would get here from amazon. 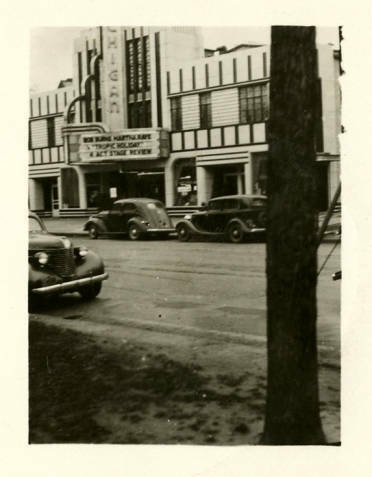 I found this old photo in the Saginaw Public Library archives of the Michigan Theater. 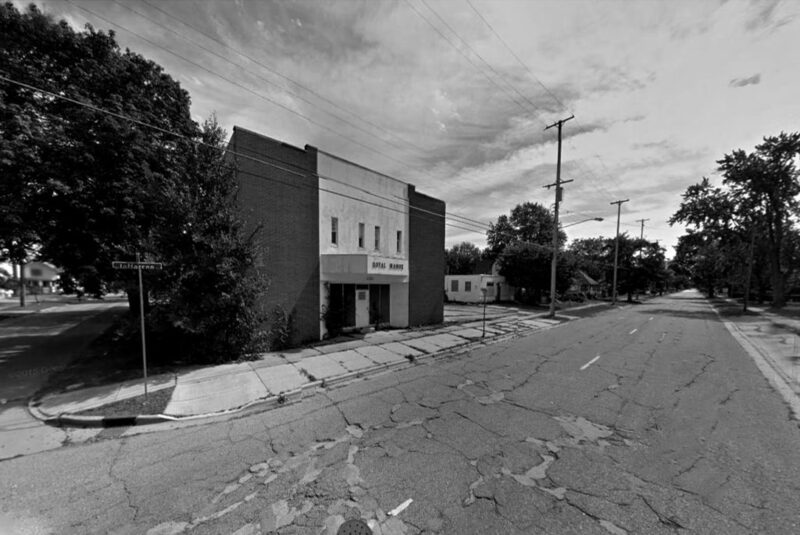 It was a little before my time, so I don’t have any memories of it, but doing a little research I found the 1216 seat theater was built in the late 1930’s at 1107 E. Genesee and owned by W. A. Casiddy. In 1945 the theater was purchased by Butterfield Circuit a part of the Publix-Paramount operation, and by 1969 the old theater had closed. There is convenience store ( which I think was a Rite Aid) on the corner of Genesee and Cherry, where the old theater used to stand. The Marquee in the photo says Tropic Holiday, which premiered in 1938, so I am assuming this photo was taken shortly after the theater opened. If you are in your car on Brockway, stopped for the light at Gratiot, you are looking at what used to be the old Marr Theater. It was built in 1938 by George E Marr, I guess it’s obvious how the theater got its name. The 725 seat grand old theater had a Mayan Temple theme, with a large marque on the front facing Gratiot. 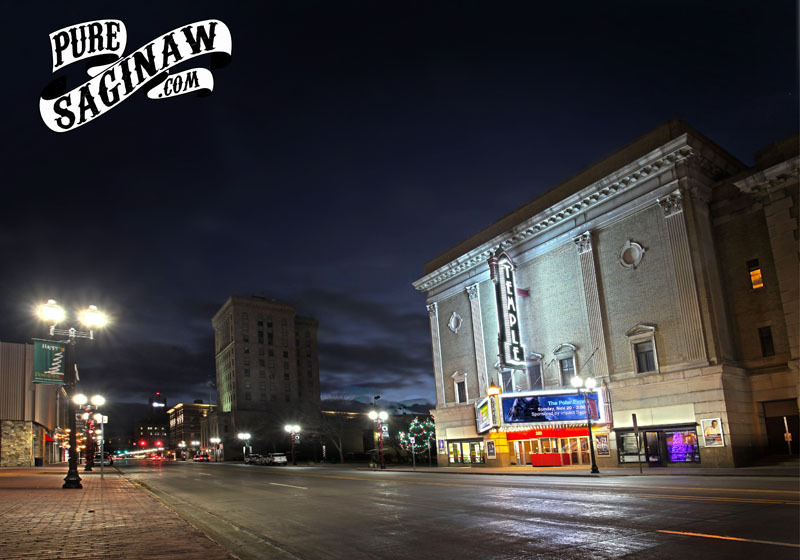 I am not exactly sure when it closed, but I think it was in the late 1950’s around the time when Saginaw residents were getting their entertainment from the television, instead of the movies. 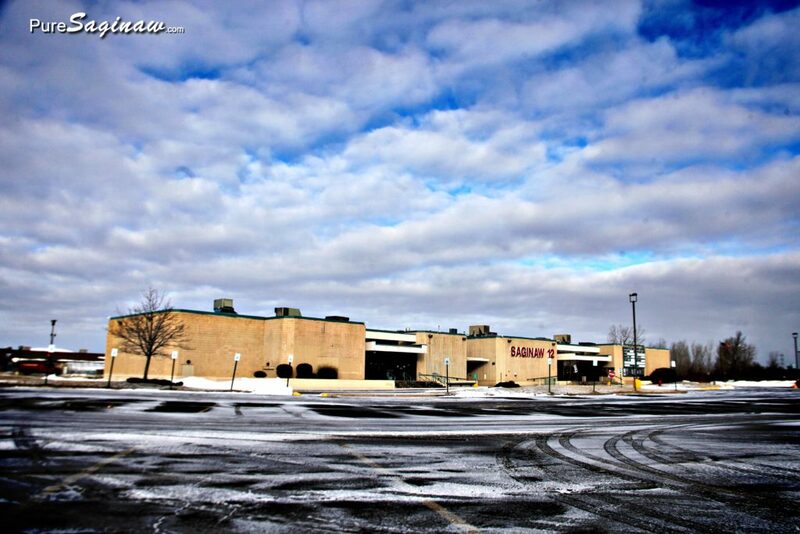 Sometime later after it closed, it was converted into a shopping plaza with a bridal boutique and a comic book store. 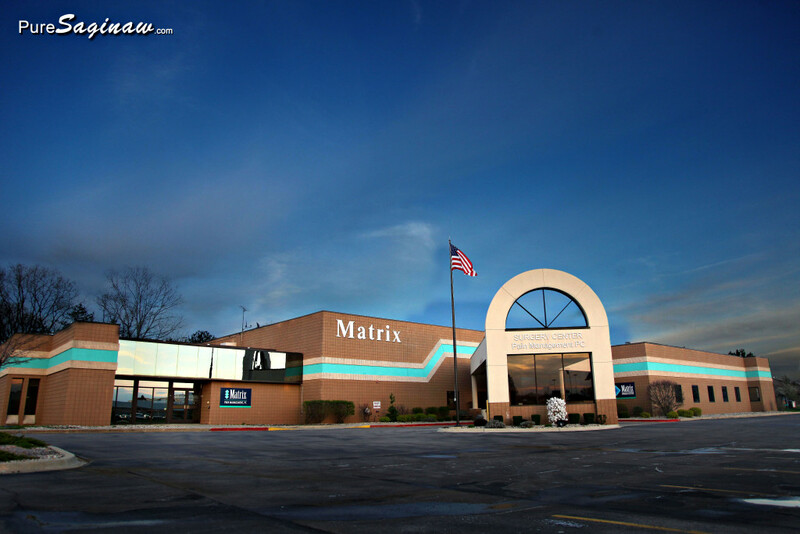 P.S one more fact about this place is I used to work here, no not when it was a theater, I ain’t that old, but in the late 90’s I worked for a company that engineered automotive tooling and test equipment. The old building still has the upstairs projector room.